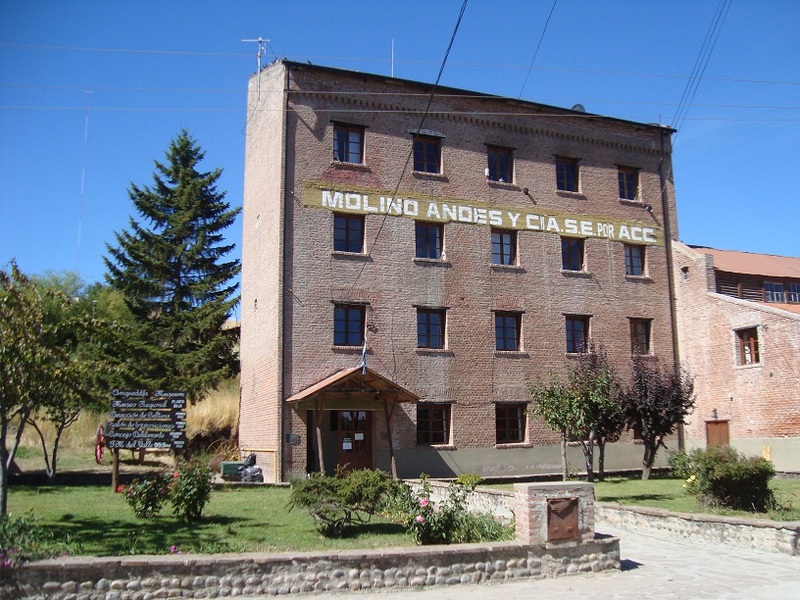 17Mar – we’ve reached the rally hotel in Valparaiso – End. 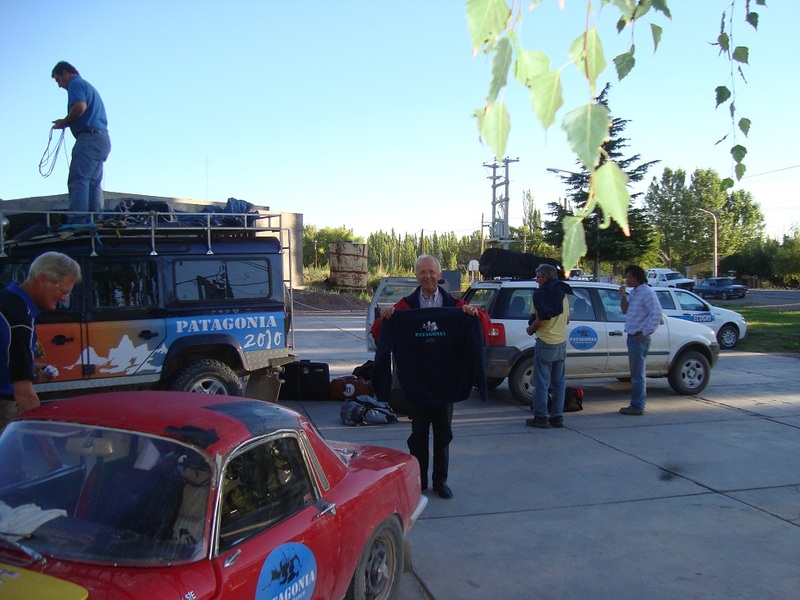 Yesterday evening the support landrover arrived on a low loader and this morning we heard that Conrad’s Alfa had arrived in Mendoza. 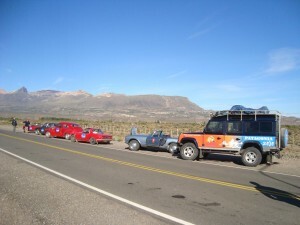 We set off earlyish for the border with Chile. Leaving Maipu there was a holdup on the dual carriageway – the problem was a sit-down protest against the national oil company – with deck chairs in the fast lane! 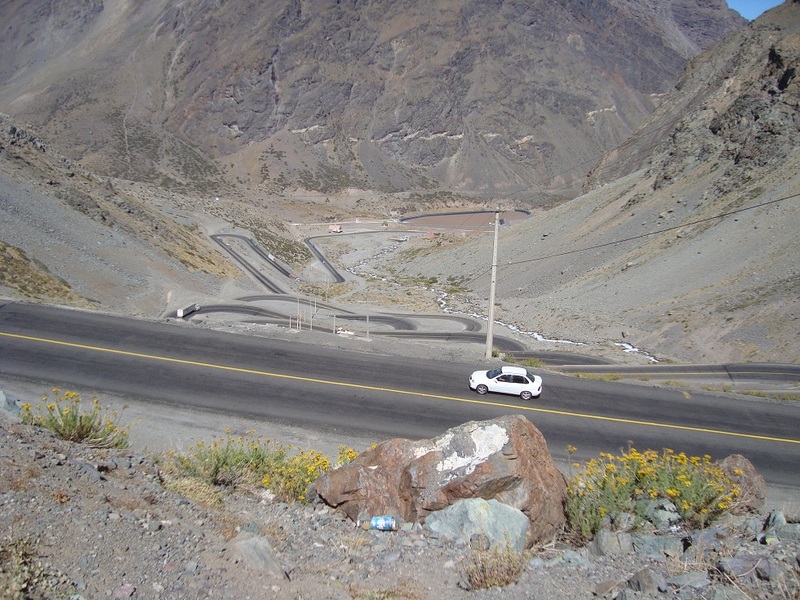 A great drive up and over the Andes to 3250 metres with dramatic scenery and the engine seemed fine (hope I can still say that tomorrow!). The border crossing was ok as it wasn’t too busy (we’d overtaken them all!). Roadworks meant there was single file traffic both to and from the top of the pass and we were lucky not to be delayed. Then a run through the cities of Vina del Mar and Valparaiso to find the hotel in the old town with steep narrow streets; again we were lucky that although the GPS gave up we found the hotel. Others must have had a problem as only 3 cars have arrived so far and they arrived 3 hours ago. We’ve done over 6,100 miles at an average of nearly 29 mpg, we’ve turned the car upside down, put it back on its wheels and carried on driving and problems – very few, replaced a trunnion and solved a starter/charging problem left over from before. They say Loti are sensitive, fragile cars – not true. As for the engine – fantastic, apart from adding a little oil we’ve done nothing to it; not touched timing, points or plugs. What a car!! 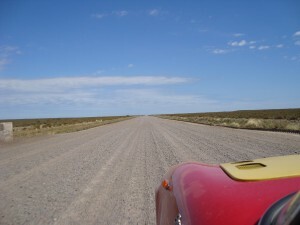 16 Mar – a gentle day all tarmac 430kms. At breakfast we heard that there had been a tremor overnight and Livvy woke to hear the lights rattling. We also saw that Patrick had arrived – at 4am. So all the participants cars are up to speed and running and the two causing concern are the organisers! 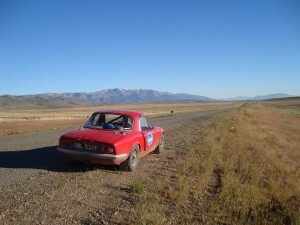 Conrad’s Alfa may arrive in Mendoza with the mechanics who are repairing it, whilst the rally support landrover has only two gears and may die at any moment. 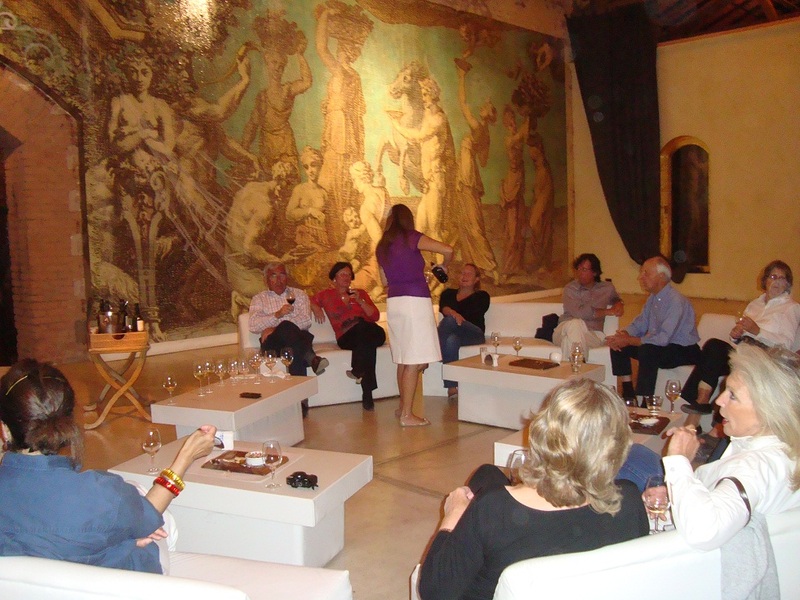 Our destination was Maipu, south of Mendoza in the wine heart of Argentina so we had to visit an vineyard and the hotel has arranged a tasting session for later this evening. Tomorrow we head for Valparaiso in Chile and on Thursday the docks – end of rally! 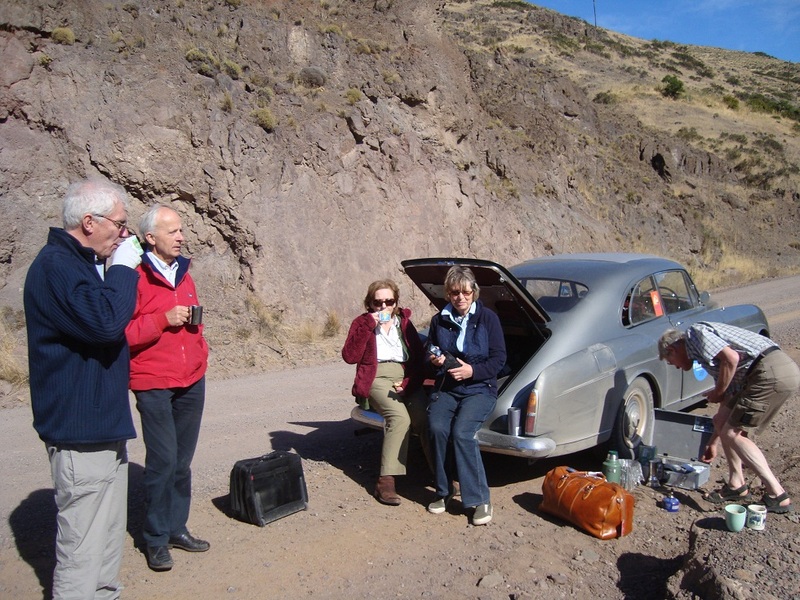 15 Mar – we were now down to 5 cars as Peter/Sue were heading south and Patrick and Conrad’s cars had not caught up. 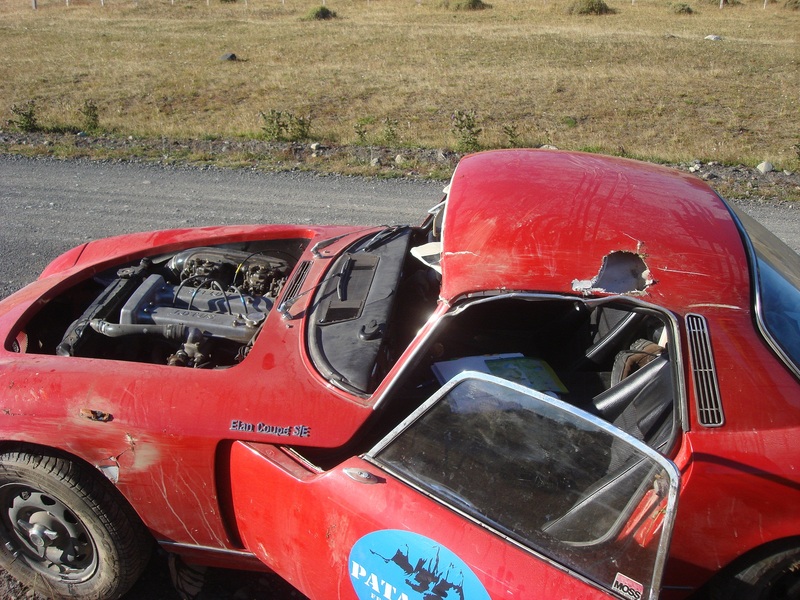 We later heard that Patrick, having solved the wheel bearing problem had set out with Conrad but lack of fuel and a smashed radiator meant that they spent the night in sleeping bags in the car. The landrover did arrive at the hotel but not till midnight. Our day started with the problems of heading east into the bright, low morning sun (and the perspex screen) so my head was soon out of the window. There were some navigational problems as we were on the detour with no GPS and several cars took wrong turnings. It was a long day and the ripio was dustier than usual and the fastest car took 9 hours for the 560 kms. 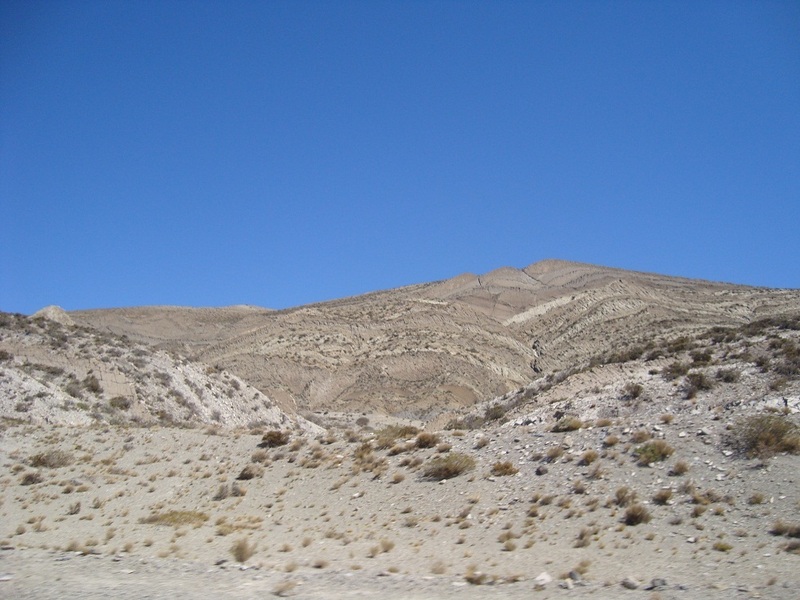 The landscape was mostly barren rock and we passed numerous old volcanoes and odd rock formations – some looked like slices of bread. 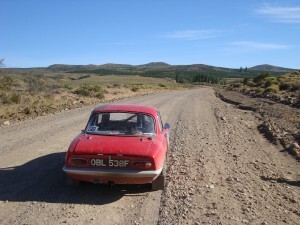 14 Mar – Another short day 220 kms with tarmac and ripio. Early news was that Conrad’s car was not repairable in the time available as it was still blowing out coolant. Met up with Peter/Sue and Klaus/Maja for a roadside coffee stop on the ripio and later passed a monkey puzzle tree plantation. Our hotel was on a peninsular into Lake Alumine and our room looked straight out west onto the water – so Allison can have her setting sun. Tomorrow is a long day – 600kms on roads the rally has not driven – this is our detour around the earthquake area of Concepcion. 13 Mar – a short drive 200km to St Martin los Andes but first we heard that they had been working on Conrad’s car till 1am and it still wasn’t working – no compression. The Alfa is similar to the Lotus, Webers and twin overhead cams with a timing chain. I offered to help. We found that TDC had not been identified and after some searching we found the marks on the pulley and on the front cover. Allison found the internet forum and we located the corresponding cam shaft marks; one shaft was out by one tooth so that was adjusted. There was a spark but it would not start and the rally mechanic was convinced there was a fuel problem. We left them to it and set off (hours after the others). It was the coldest day of our journey and threatening rain as we passed the more-than-usual police road checks and reached Angostura for coffee and cake. Then alongside the lakes on the ripio (poor quality), the scenery less spectacular in the gloomy low cloud. Klaus and Patrick passed by as we stopped for lunch. Then 2km along the road there was Patrick with the front wheel off. The wheel bearing repair had failed as the bearing was the wrong size. The boss of a road repair team took us into Angostura but it was 3pm on Saturday and everyone was closing for the weekend. 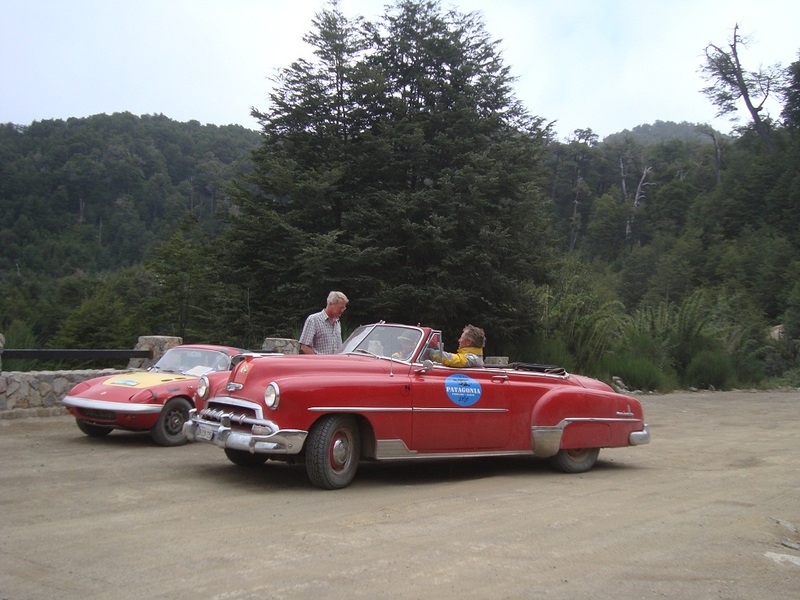 The best option was to take the car on a loader back to Bariloche. We resumed our route and were the last in with just a few a few nuts to tighten up. 11 Mar – there were two routes to Bariloche, the scenic ripio route through the National Park and the tarmac route. 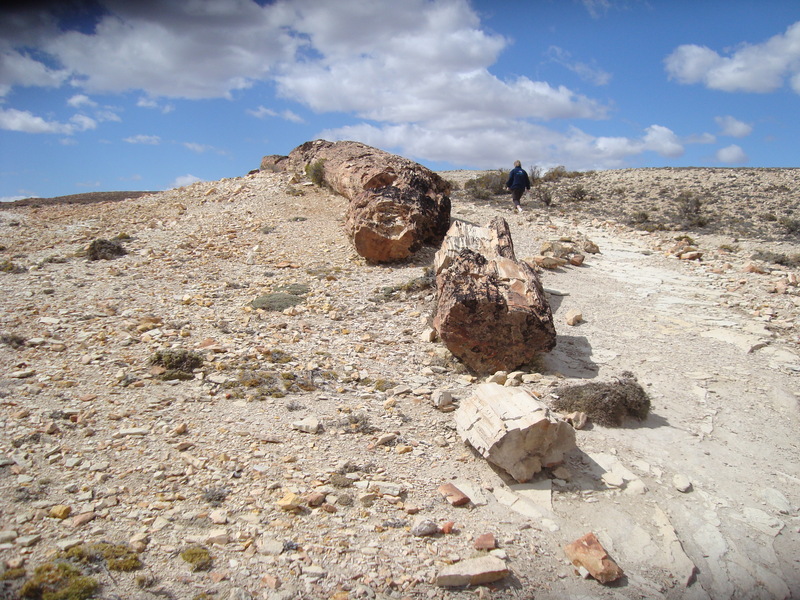 We chose the later and visited Maiten and the railway engineering workshops before having lunch in the “hippy” town of El Bolsen where Allison bought a stone to replace one lost from her bracelet. Our hotel is on the Llao Llao peninsular where we were happy to be rejoined by Peter & Sue, back from England with spares for Conrad and Patrick (but his immediate neede is for the spares they did not bring….! Changed the Elan’s oil filter but apart from that………..what’s not broke, don’t fix! 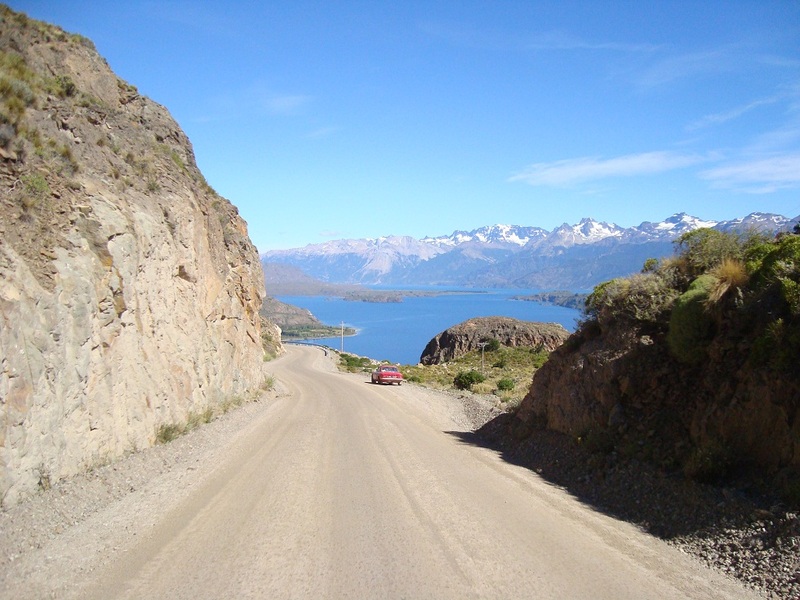 10 Mar – the first of two gentle days driving with a stop in Esquel and on to Bariloche and a rest day to follow. 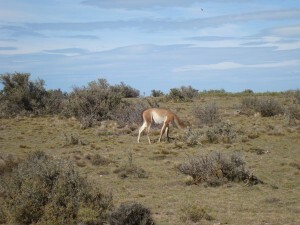 The landscape was arid Patagonia relieved with occasional oases of green. 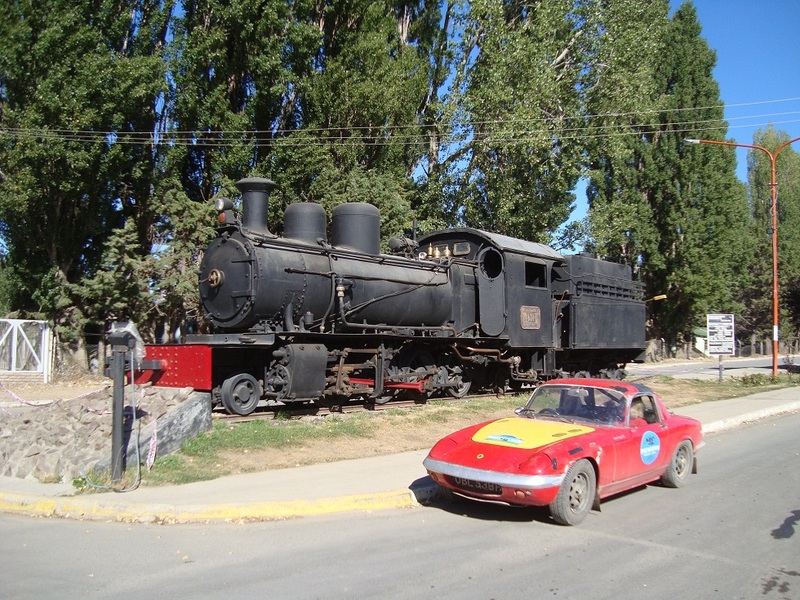 Esquel has two features – the nearby Welsh settlement of Trevelin and La Trochita –the old Patagonia Express, a narrow guage railway designed to open Patagonia for settlers. We visited Trevelin for a large “Welsh Tea” in one of the many tea houses and watched the smoke from a “field” fire (they have big fields!) fill the ring of mountains. Others went for the train and helped shunt it round the sidings before putting it into its shed until Saturday. 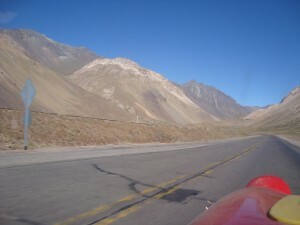 9Mar – 300km due east to Sarmiento. The day started badly with the low sun straight into our eyes making the perspex windscreen impossible to see through. 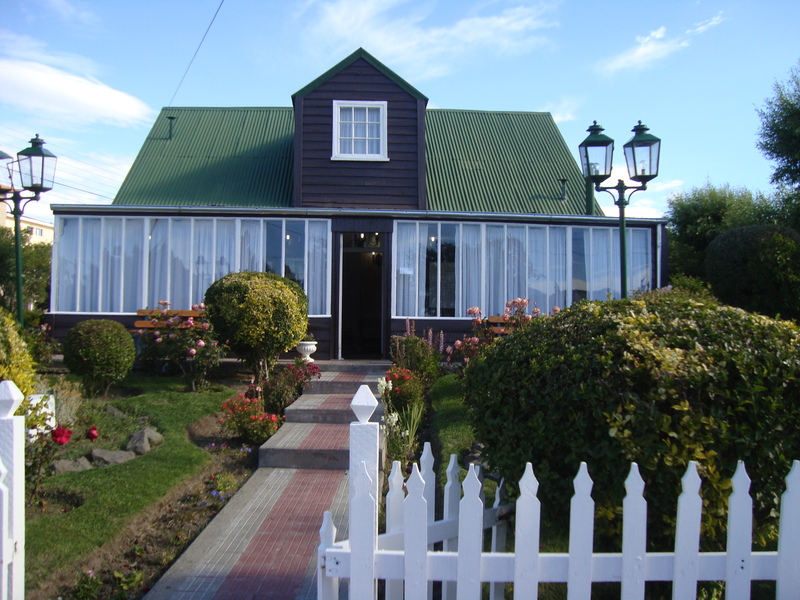 We had scoured Coyhaique for brasso last night – and found a tin. Now in the middle of the ripio we tried using it to clean the screen. It worked to a limited extent – but we made more progress when I drove with my head out of the drivers window! (hair now full of dust). Progress was slow with the lack of visibility and poor surface. 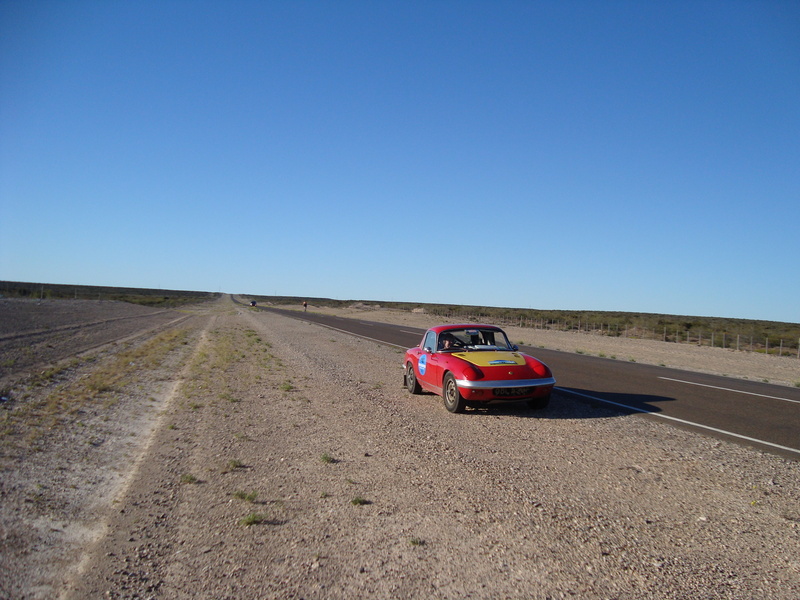 We passed through the border and for a moment believed that Argentine ripio would be better than Chilean – not for long and we were soon in 1st gear again. We had the best part of 150km on ripio, generally in 2nd and 3rd gears and 4th only on rare occasions . Towards the end the combination of boredom and a better surface saw us at 50mph – but driving on the sumpguard as much as the wheels! 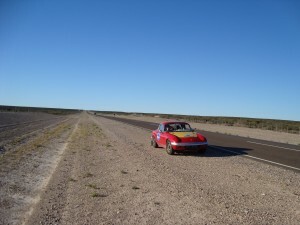 After an unexpected lunch in Rio Mayo where we treated ourselves to a peaceful hotel meal, quiet, cool, dust free we found Conrad at the roadside and had tea – what else? 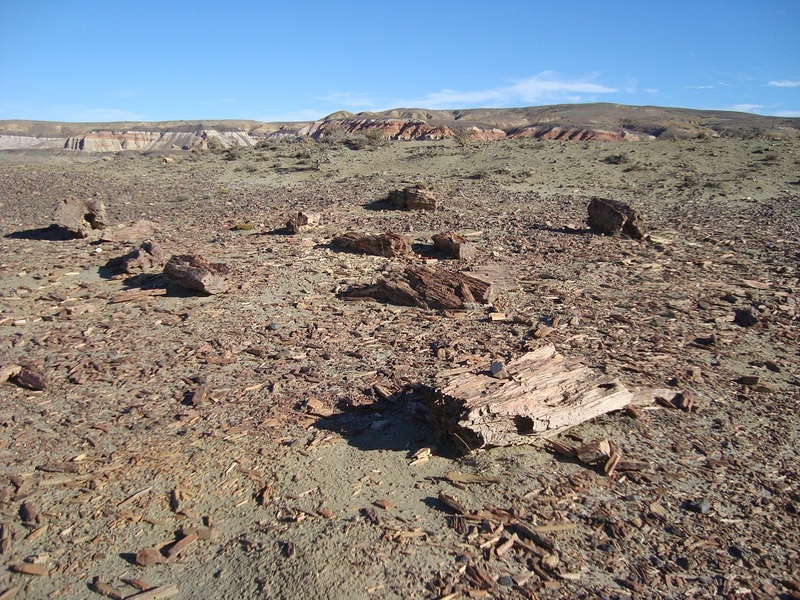 We checked the car after seeing the petrified forest; the car was fine apart from the water temperature sender unit which had broken off half way along the morning’s ripio. 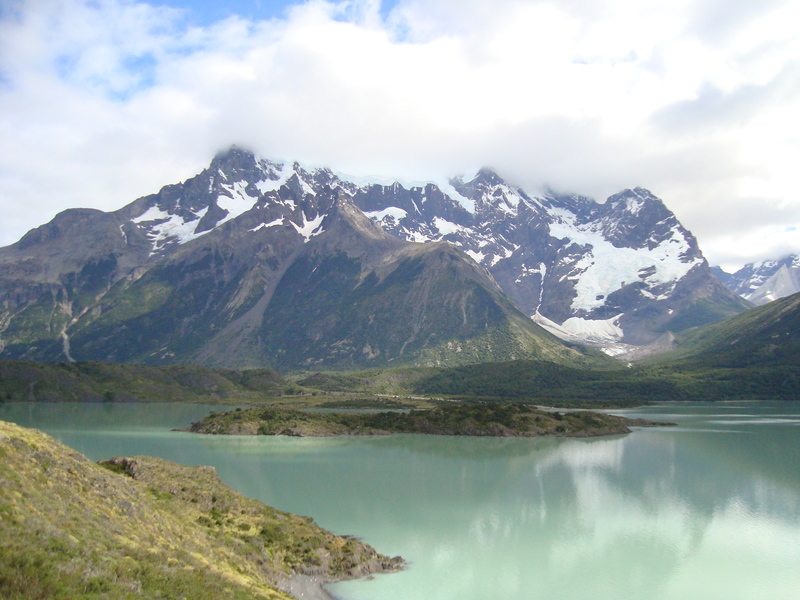 8Mar – a gentle run away to Coyhaique 270 kms, about 2/3 on variable ripio and then some super tarmac at the end as we climbed up to 1120metres from Cerro Castillo and then dropped down to the valley. An excursion to the Cave of the Hands was a disappointment as we laboured over rough tracks to find that the original hand paintings were destroyed by a volcano 20 years ago! Giancarlo had more problems; this time shock absorbers but now repaired. 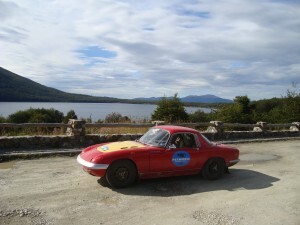 Tomorrow we return to Argentina and stay there until we head for Valporiso to return the cars to their containers. 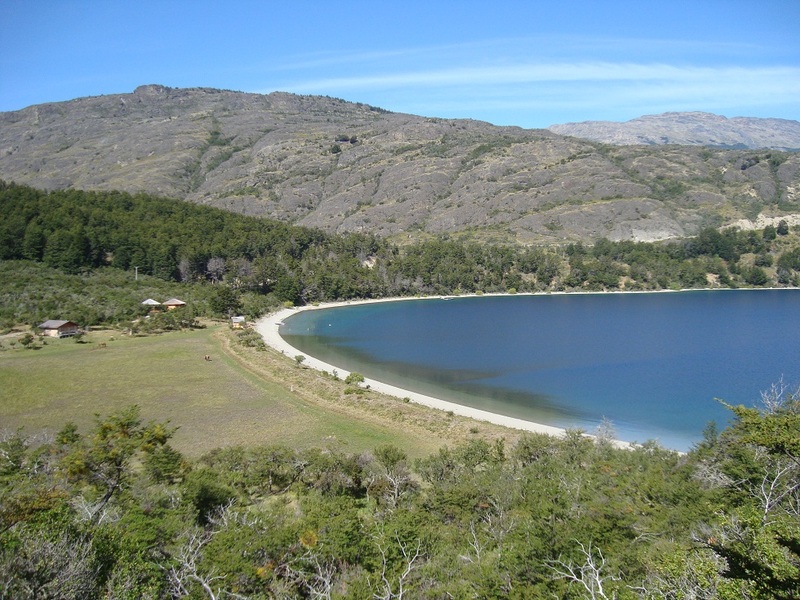 7Mar – a rest day at El Maiten on the shores of Lake Carrera. 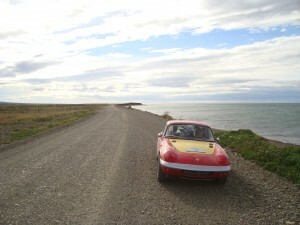 We checked the Elan yesterday and its in amazingly good shape. 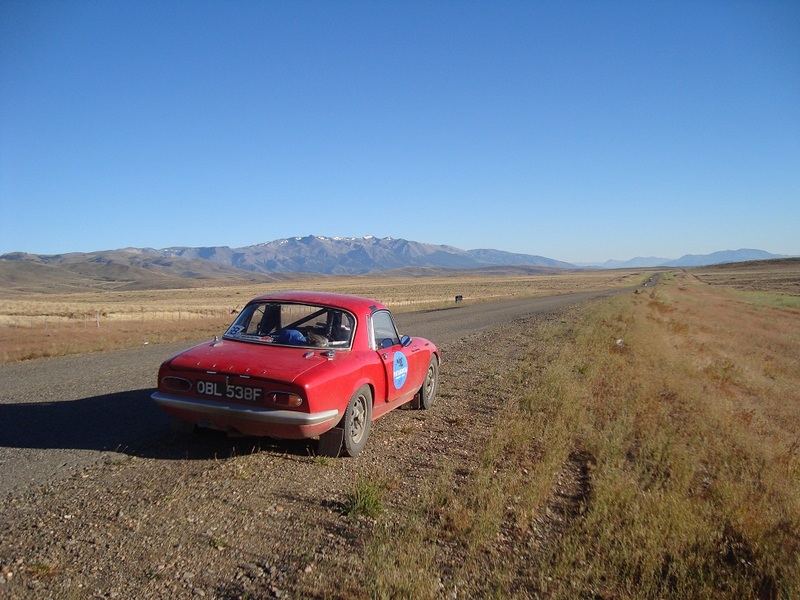 We’ve now travelled 4,000 miles, used 600 litres of petrol and only 2 litres of oil. 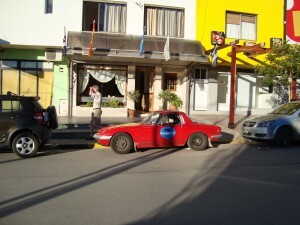 Giancarlo got his car mended and reached the hotel yesterday evening. We awoke to rain but by 10.00 after a log, late breakfast it had cleared to give a bright sunny but windy day. 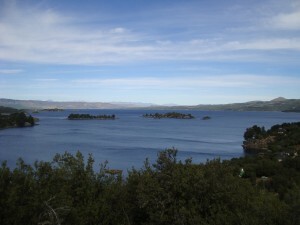 A new route has been identified for March 15-17 to avoid the area around Concepcion (hit by the earthquake). Instead we go to Mendoza and from there to Valpariso. 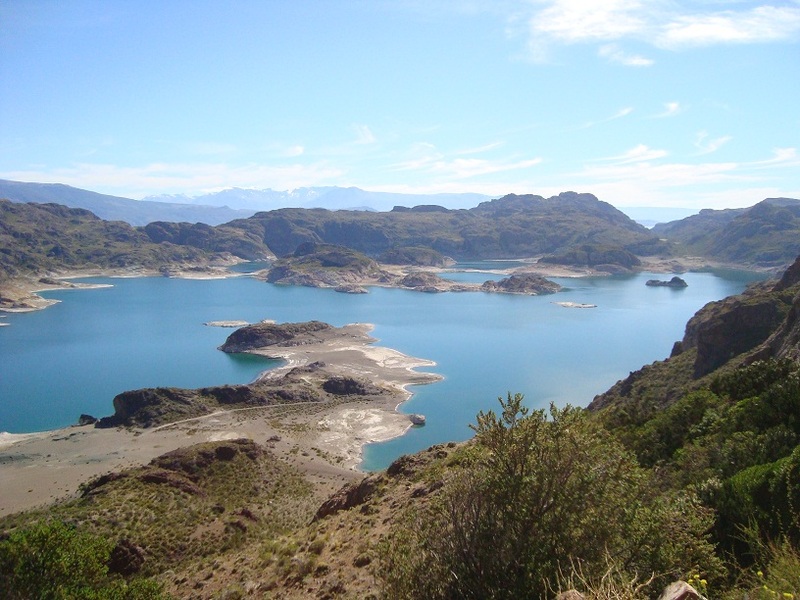 6Mar – a short day (300km) with a border crossing the Chilean ripio was as bad as we expected but was relieved by the spectacular views of lake Carrera with the snow capped Andes behind; with views like that and a reasonable arrival time you can forgive the ripio. 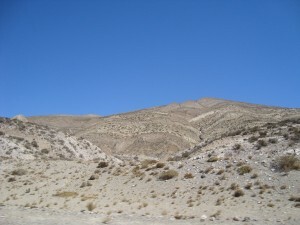 The border crossing was enlivened by the need to get through before a particular Chilean customs official started her shift. 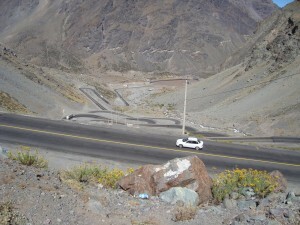 In the entire section of Argentine/Chilean crossings she is convinced that right hand drive cars are not permitted and the helpful Argentine officer told us she started at 12.00. 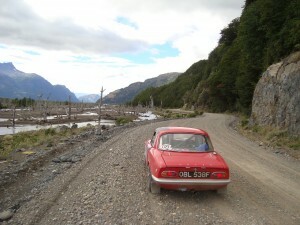 Late news that Giancarlo in the Volvo has a broken wishbone and the car has been transported back to Chile Chico. Tomorrow is a rest day so hopefully he’ll rejoin then. 5 Mar – An early start (6.30) for a long day – and it was very long; nearly 600km mostly on ripio, whose quality varied from poor to bxxxxy awful! The two worst types were where there were mounds of gravel between the tyre tracks, fine for higher cars but just positioned to continuously catch the underside of a low slung Lotus. The other was the hard lumpy rocks which pounded the front suspension and at least one wishbone bush needs replacing. 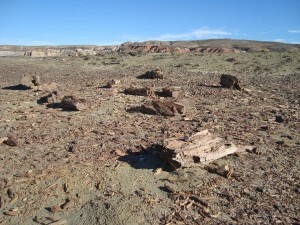 It took 11 hours, the landscape was bleak and as hard as the track. We stopped for coffee at “Siberia” in the middle of nowhere and Allison insisted that this collie photo is included – there are collies everywhere and she’s missing ours. At the end of the day we crisscrossed the brand new ribbon of tarmac but looking was as close as we got. The Estancia we stayed in looked run down, power was from a generator, the welcome reluctant but a small group meal with copious bottles of wine made for a good end to the day. 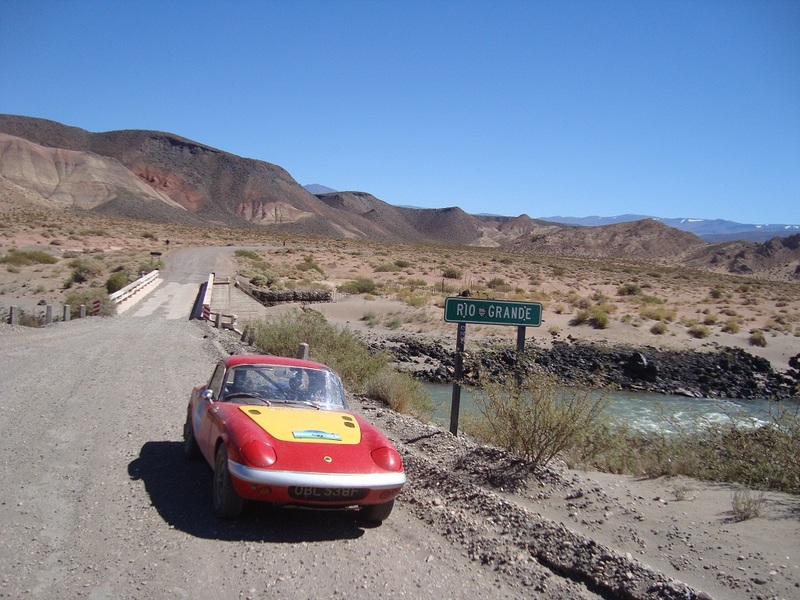 4 Mar – a gentle 300km mostly on good tarmac on Ruta 40 (Argentine equivalent of route 66). Time to stop to see some cave painting (not worth the exorbitant charge), for photo opportunities and a civilised mid morning coffee and cake with Livvy, Denise and Robert. 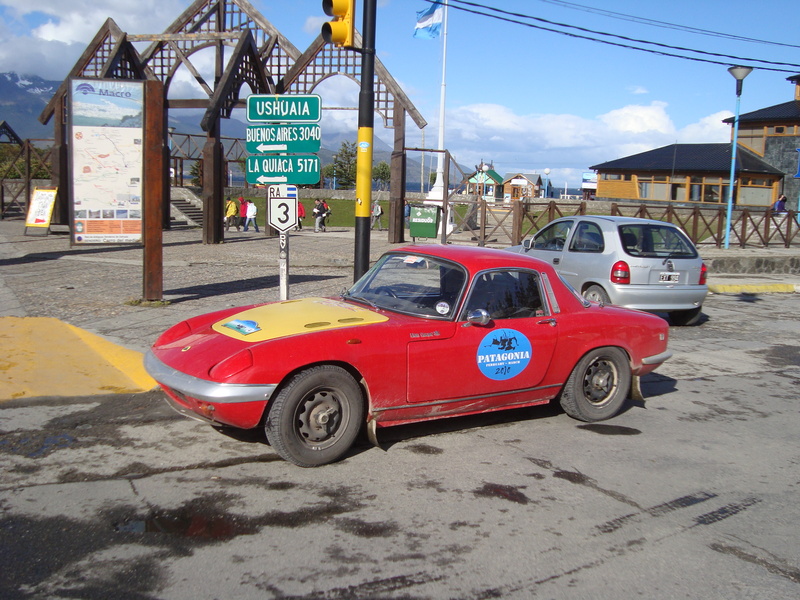 The petrol station in the small town of El Chalten was occupied by 5 rally cars when we arrived, waiting for the promised 2pm opening – which it did! We had restricted ourselves to 60/65 mph so the car was happy and I used sunglasses so there was no glare from the perspex windscreen. 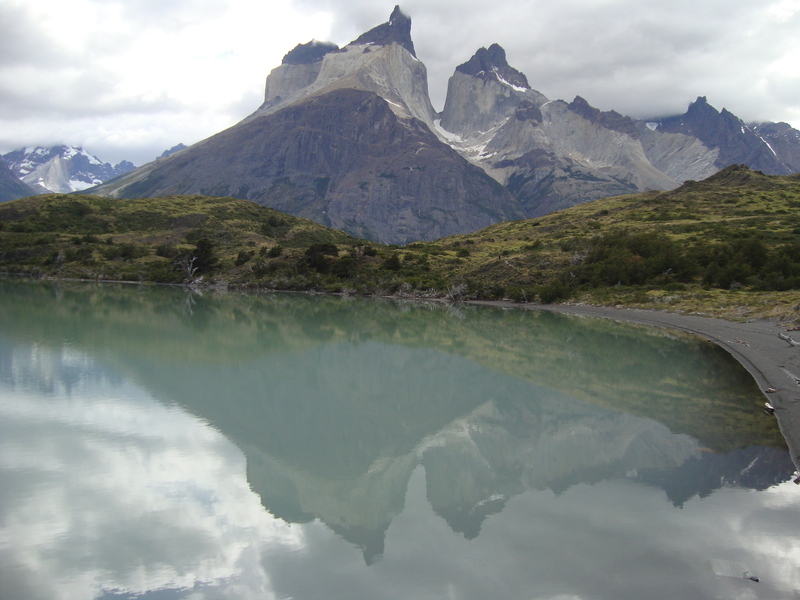 March 2/3 – a gentle run from Torres del Paine national park to El Calafate and the world’s largest glacier – Perito Morino………..err no! 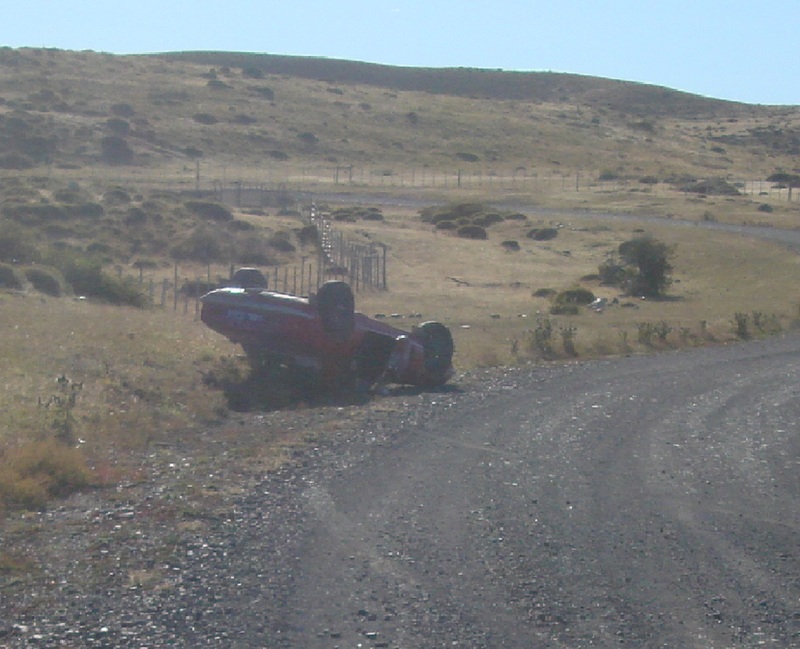 About 50km into the day’s 400km run, Allison misjudged a corner on the ripio, lost the rear end, slewed across the road – and we ended up on the roof in a ditch. Its very disorientating hanging from your seatbelt, trying to work out how to sit on the inside of the roof, switch off the engine and open the door. The passenger’s door opened and I crawled out, the drivers door was trapped in the ditch so I had to pull Allison out of the passenger’s door feet first. We were unhurt, not even a scratch. We started to remove stuff from the car because petrol was dripping from the fuel cap and we couldn’t get to the battery as the entire boot would empty first! 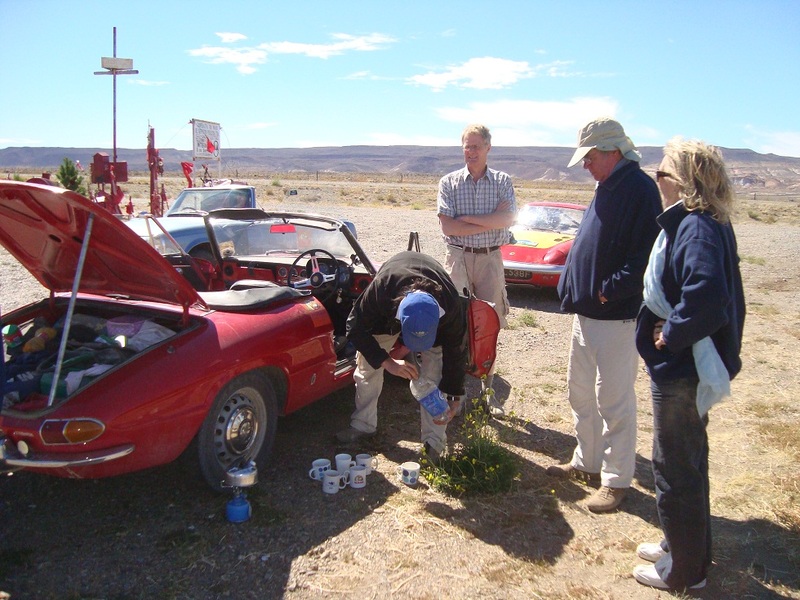 Patrick, Rod and Cath appeared in the Chevvy and we unceremoniously righted the Elan – none of this gentle lowering of the suspension, it was roof, side upright. Everything looked ok, the wheels were all vertical, undented, no oil had leaked out so we repacked everything, started the engine and continued. Ok we had no windscreen, both door pillars were broken, there was a large hole in the roof (where my head might have been? ), the passenger’s door had split in two and the lower hinge broken and the side of the car a mess. We drove on to the border where we found the support crew who applied lashings of ducktape. Progress was slow as I was terrified of losing the rear screen. We did the remaining journey at 35mph through some howling winds, both dressed in fleeces, windproof jackets, hats and gloves – and were still cold. In El Calafate, we were able to find a glazing company who agreed to take the car next morning and fit a temporary perspex screen. 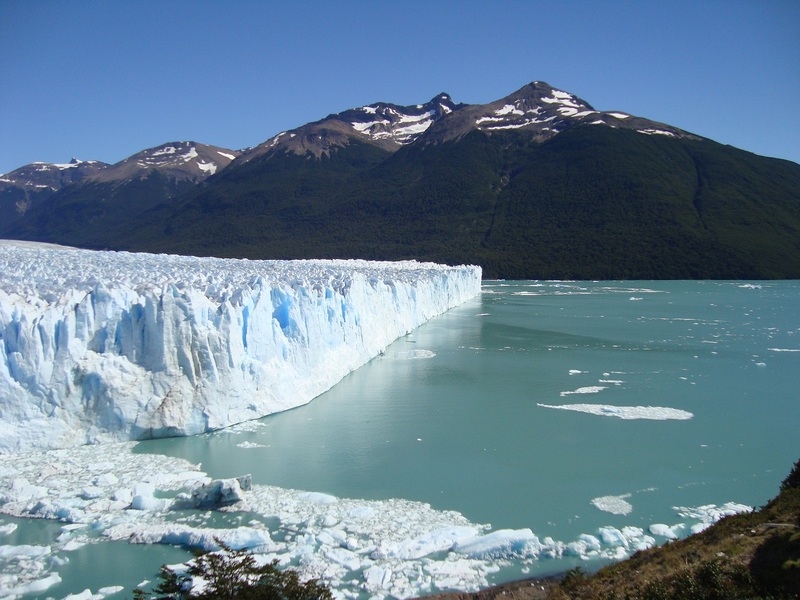 3 Mar – we dropped the car off and took a hire car to the glacier – tourists for a day. This huge glacier is the reason this town exists and is spectacular; the 30 metre high vertical cliffs of ice stand out into the lake and periodically pieces crack and collapse into the water sending slow surface waves and more substantial ones underwater so that more distant shores feel the swell but with little visible cause. We picked up the car and found a new screen – noisy and with distinctly imperfect vision when driving into the sun – its better than no screen at all – the car rolls on…………. 1March – a rest day after the group meal last night. Time to check the car, give it a quick wash – there was dust everywhere – then a wander through the park – to a waterfall, watching the reflections of the mountains in the now still waters and listening to the sounds of avalanches from the snowy peaks above us. So quiet and unbelievably spectacular scenery made for a memorable walk. The hotel had a very rickety wooden ramp for cars so put the Lotus up on part of it for a gearbox oil check but as it looked a bit doubtful took it off again. 28 Feb – no grease gun so plan B and by 9am we were on the road. We had been told of a classic car museum just off our route between Punta Arenas and Puerto Natales. We thought that maybe they’d have a grease gun –they did but the nozzle was too big and we ended up with a puddle of grease. We carried on. There was a strong cross wind and keeping the car in a vaguely straight line at anything over 60 mph was very difficult. Leaving Punto Natales our GPS was confused by the in/out routes preloaded and intended to give a circuit round the Torres de Paine National Park. We found the correct (anticlockwise) track and moved from Tarmac to ripio – couldn’t stop laughing at the sign “incipio ripio”. 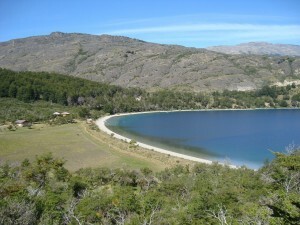 The park is a mixture of mountains and lakes and our hotel was perched on a small island in lake Pehoe. 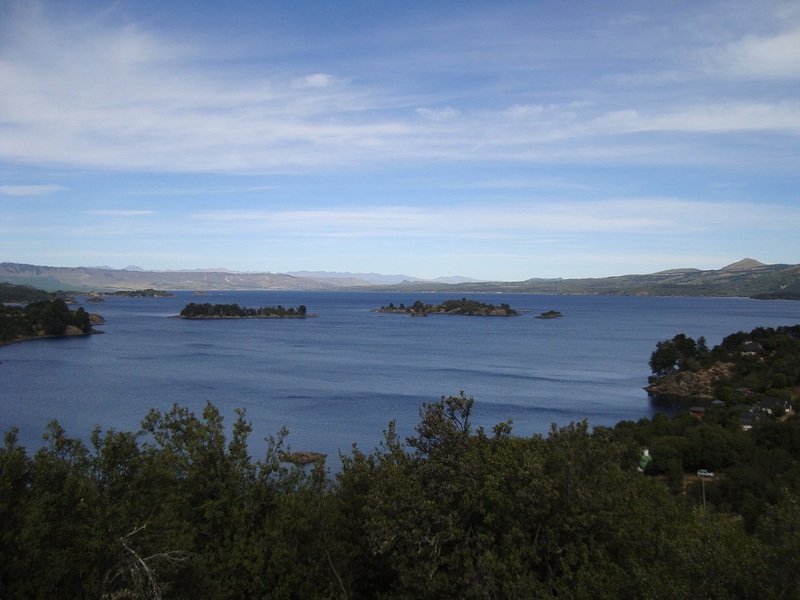 27 Feb – woke up early thinking that there was a one hour time shift between Chile & Argentina so maybe the 14.00 boat was actually 13.00 – no the time shift starts on 14 March. 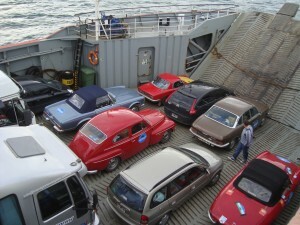 The run was easy, borders quick and ripio good so we arrived well before the ferry sailed. 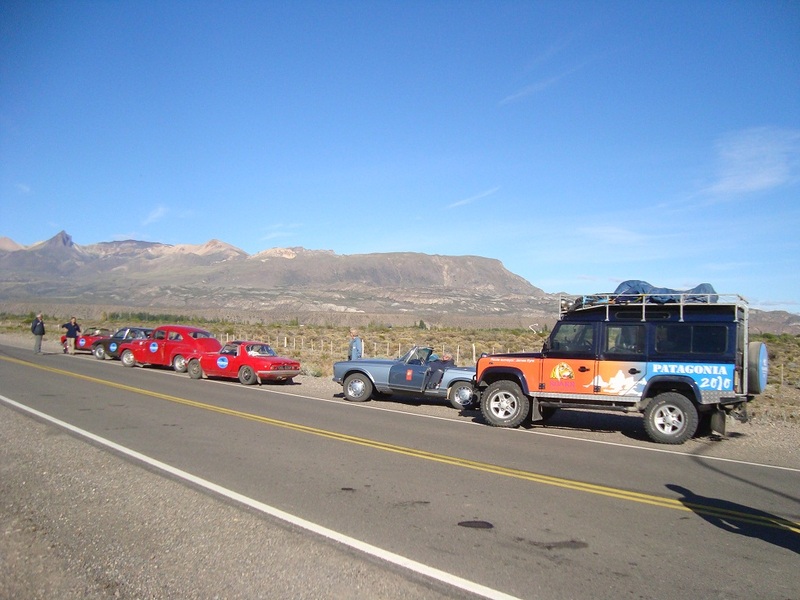 Two cars elected to take the longer route with a normal start time – but no-one knows where the landrover with the mechanics went. Television news is of a major earthquake in Conception where we are due in 16 days time – the organisers may need to re-route……. Checking the car found that the near side trunnion was worn – fortunately we carry a spare – but incredibly no-one has a grease gun and all the car spares shops are closed…..plan B is take it apart and apply grease by hand. 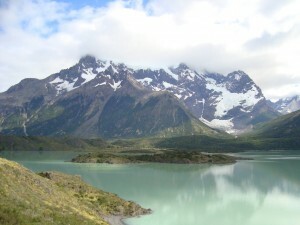 26 Feb – rest day in Ushuaia. 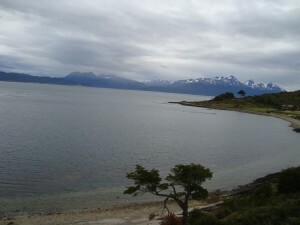 A boat trip along the Beagle Channel in the morning followed by the museum of the End of the World and civilised lunch. 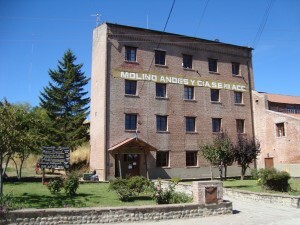 Then another museum – housed in the old prison. Early night called for as we get up at 4.30 tomorrow to catch the only boat of the day at 14.00 and to get there we have one border crossing and 450 kms with 150 km of ripio – more dust! 24 Feb – no news of petrol so we set off in an early group of 4 cars; we had as much fuel as anyone and easily reached the filling station 120kms away. Allison has a thing about penguins so we left the main road and onto the ripio to find the 4th largest colony of magellan penguins. Car was fine and I was happier as I’d tweaked the voltage regulator box again (the setting from Feb 21 produced a very hot battery and cooking batteries is not a good idea!). Then an easy run into Rio Gallegos – a town founded by English settlers in the 1880s. En route we fell off lovely tarmac onto rough and dusty gravel and the car complained – nasty squeaks from the back end. The shock absorbers have become weak and the noise was the springs grinding against dust – we live to drive another day! 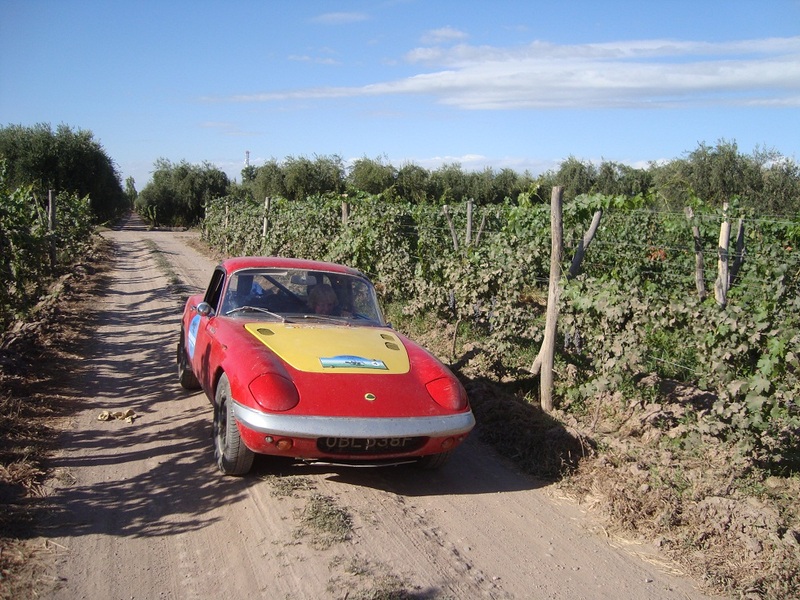 we were the first visitors of the day but one other rally car made the deviation on the (gravel) ripio – it was worth the trip, the landscape was spectacular, what the moon should look like with almost no vegetation, a dried up lake and an extinct volcano. 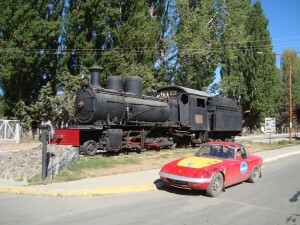 22 Feb – 600km to Comodoro Rivadavia passing the Welsh towns of Trewlew and Gaiman. Trewlew had a power cut and Gaiman seemed to be largely asleep – there are plenty of Welsh tearooms – but all are closed in the mornings. The only bank refused to change sterling for Pesos – US dollars only. 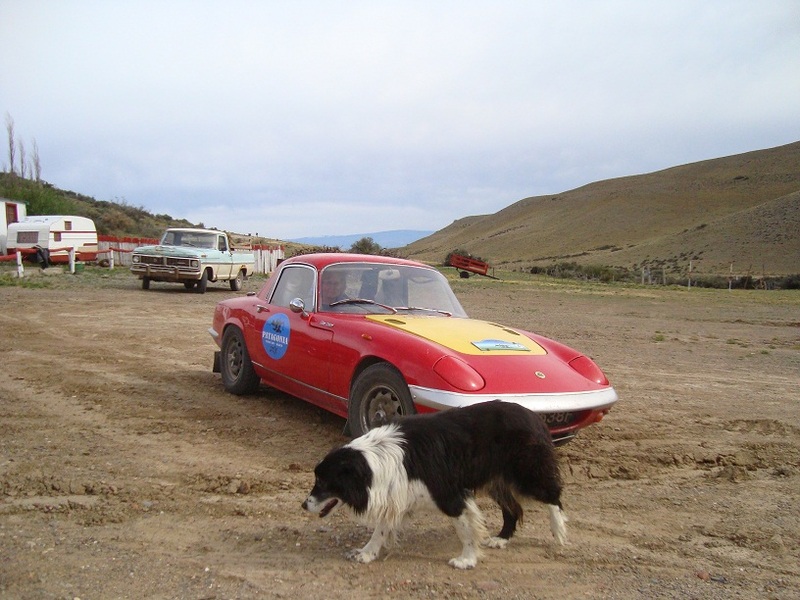 Then a long haul south through an ever more desolate countryside with less and less vegetation to the oil town of Rivadavia.Car now starting and charging happily – now its drinking water – someone said we were driving too fast…………what’s a Lotus for? It is a little unhappy on the open roads where the ruts and wind deflect it. 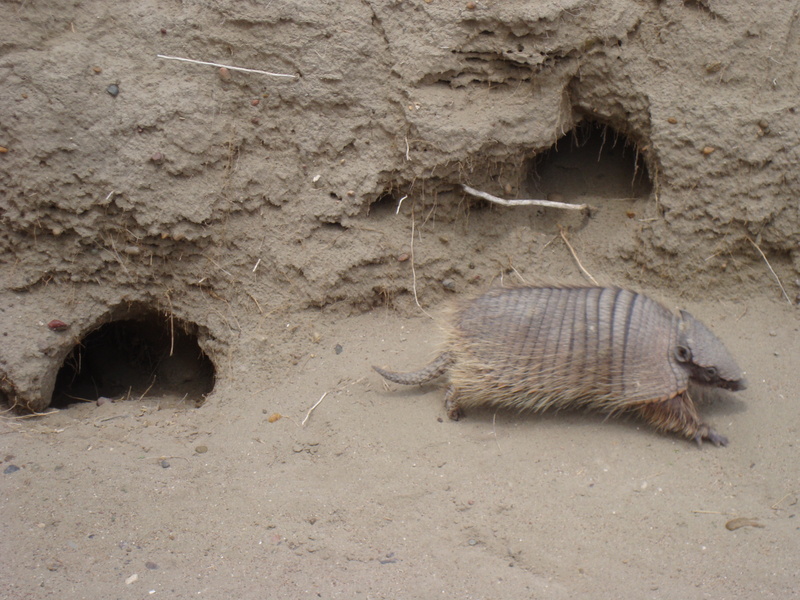 Also on the ripio where the heaped gravel catches the underside and can give unexpected changes of direction. 21 Feb – a rest day so time for some tourism and our first taste of ripio – well graded gravel – but slippery and with ruts which can deflect an Elan. It had rained hard last night so some roads were closed but in the morning there was less dust. We saw penguins, elephant seal cubs, sealions, armadillos, foxes, hares and rhea plus plenty of birds. 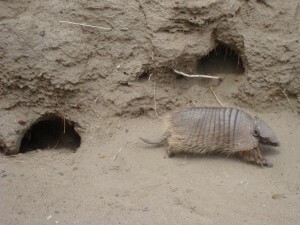 I should add that the foxes (wild animals in a nature reserve) were waiting outside the kitchen of the café awaiting the chef’s whistle for scraps whilst the armadillo was searching the car park for crumbs). The rally has now regrouped but we’re down to 6 cars plus the organiser’s – and 5 of them are red! The car started every time today and the battery is charging nicely (I thought too nicely at times – burning out the dynamo by over doing it would be a very bad idea). 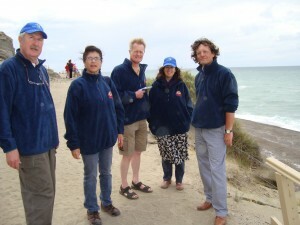 20 Feb – an unexpectedly short day as we were now 180km further east than planned. 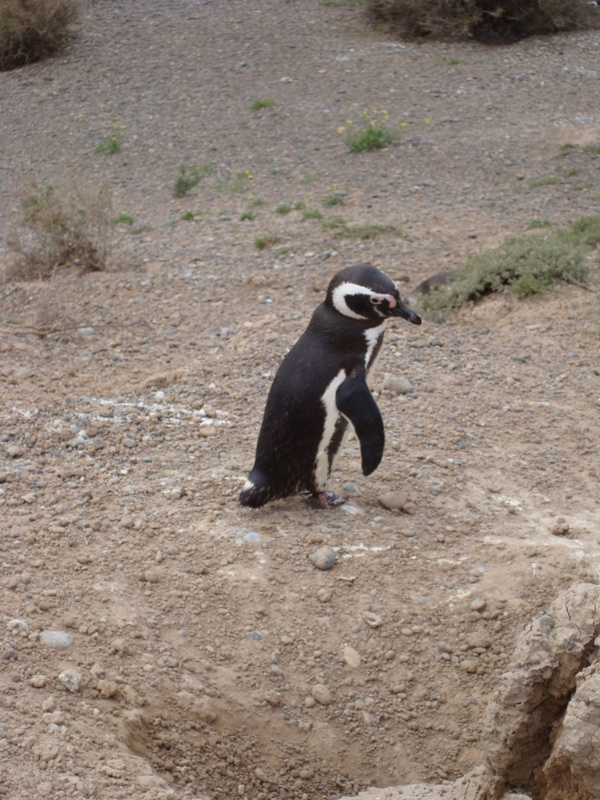 It was just 320km to Peninsula Valdes – a nature reserve with whales, sea lions, shunks and penguins – though the whales are absent at this time of year. The car started every time – so maybe there was a starter problem and now it’s a charging problem……. 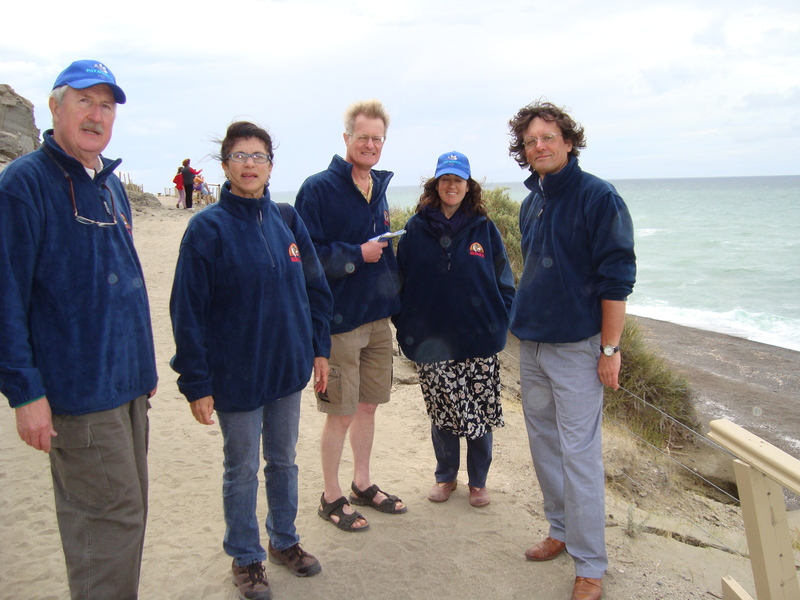 19 Feb – we woke at 6.15 for an early breakfast and a long day – 710kms and it was raining. – heavy rain. The car started so that was good but progress was slow with the combination of the rain and the ruts. 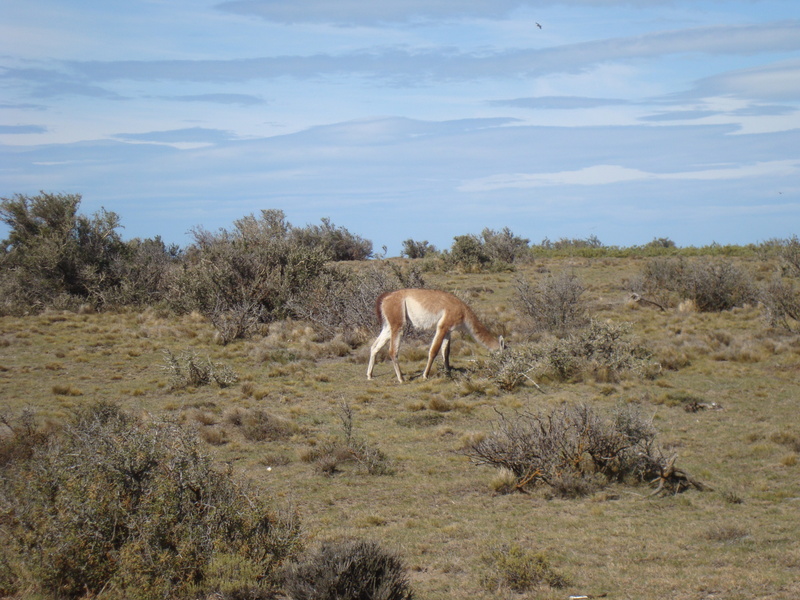 Our route was west to Bahia Blanca before turning south to Carmen de Patagones. Things went wrong at the first fuel stop when the starter did – nothing, we were travelling with Klaus and Maja who helped push. At the second fuel stop it was the garage owner who pushed……………..problem not solved! 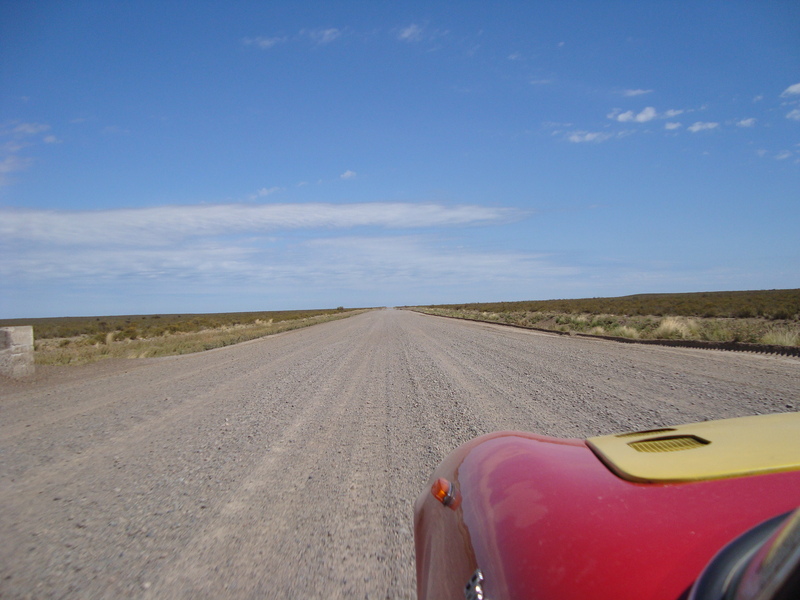 The roads were straight and the scrubland went on seemingly for ever. There were periodic road checks to prevent the movement of fruit and meat and at one of these, just 150km from our destination we were told that the road ahead was blocked as two bridges were down – one featuring on the front page of the newspaper. We turned round and faced a 700km detour if we wanted to get to the night’s hotel (we decided to pass on that). Klaus and Maja had now joined us and we set off back the way we’d come. As we went we “collected” all the other cars except for Patrick’s. The one person we couldn’t get hold of was the organiser! We reached Las Grutas after a hard and fast drive and the rally Doctor, who speaks Spanish, arranged hotel rooms for us. It had been along day and a beer was called for! The minister of tourism flagged us off on time and after a stop go exit from Buenos Aires we made good time until stopped by police because we did not have out headlights on. Lots of document scrutiny and then off again past many other police checks. 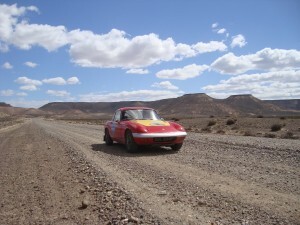 All went well until after our lunch stop when the starter motor went on strike just like Morocco. We really thought we had cured it. Back to bump starting and after that it gave no trouble. Balcarce, the birthplace of Fangio, was the overnight stop so we visited the well presented museum to him. It also has a large collection of run down Art Deco buildings. What to do about the starter motor? I found that the shaft was loose – so maybe the problem was that in certain positions there was no electrical contact. 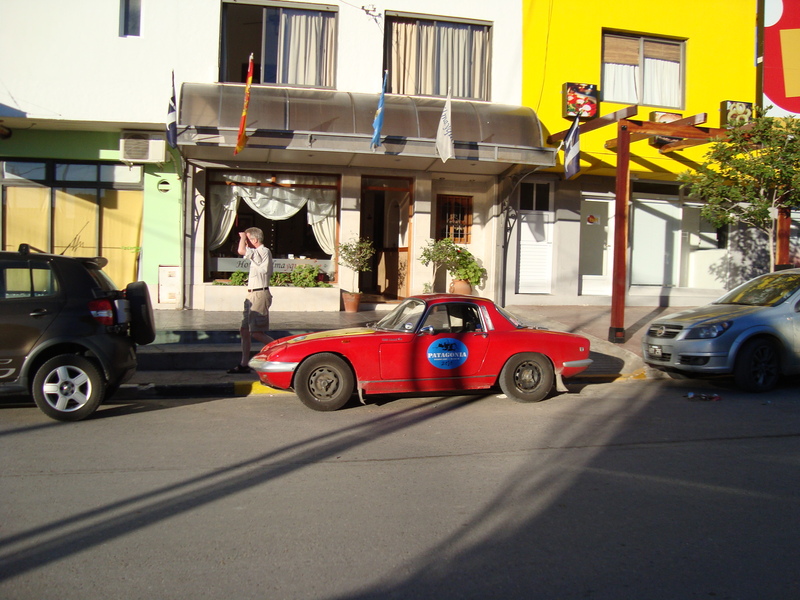 The Argentine rally mechanic took me round the town looking for a bush, then some emery paper to sand it down to fit – whilst all the while the car was sitting on some garage ramp. Total cost Ps 24 (about £4) – here’s hoping! It took 5 hours to get the car from the port today but we were lucky as 2 cars coming from Genoa took 9 hours because they were not started upon until those from the UK were cleared. The car started first time but the exhaust must have been knocked as it is a bit noisy. We did manage to fit in a visit to a modern art museum and some tunnels under a Jesuit church. An unusual street scene is the Dog walkers – they take dogs for walks (obviously!) but not just one or two! 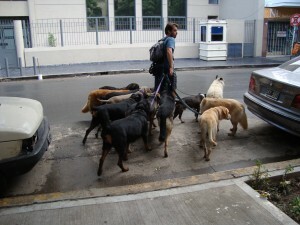 We arrived in Buenos Aires late Sunday 14th. Looking for currency exchange on Monday morning we saw a Lotus 7 and rushed over to say hello. 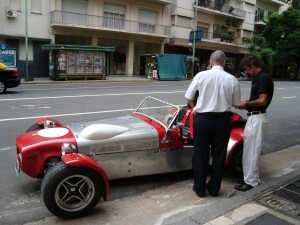 Carlos explained that he’d owned it for 5 months and had broken down and was waiting for a tow truck – not a good omen! We’d been told that we could get the Elan out of Customs on Monday, then Tuesday morning. Tuesday afternoon was spent on paperwork and we hope to see it on Wednesday prior to leaving BA on Thursday morning – though as the Minister of Tourism wants to flag us off we can’t be sure! 5 Feb – updating the technology! Now a new laptop so hopefully we will have the means to report progress. The 2009 Casablanca Challenge required more repair work than we had expected before we were ready for Patagonia 2010. There was damage to the passenger’s door which had to be repaired and then resprayed and to the footwell – but that has had to wait till later. 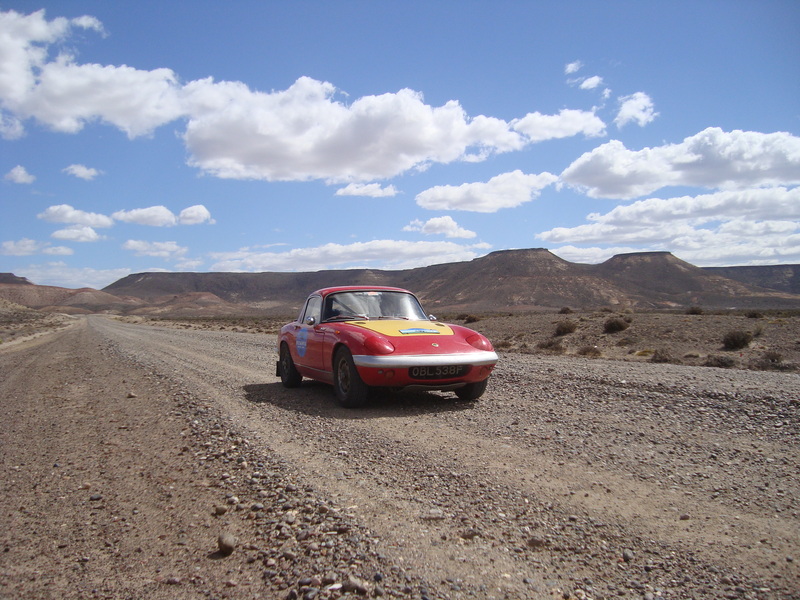 The major problem was electrical – the starter failed in Morocco but even a new battery, new starter and a thorough check of the electrical supply didn’t help. We had to return to a repaired old starter and a new Optima battery which proved to be a better combination. Casablanca had consumed points/condensers like never before so there was a new distributor and a reduction in the dynamo cut-in voltage which we hope will help – though in truth we don’t know why so many points burned out so quickly. A new` differential output shaft, seal and bearings were required – along with a clean-up of the rear-end which was coated in the oil we’d been leaking for the past 1,500 miles. There was a brake squeal to attend to and new front wheel bearings. Then with the MOT a day away, the wipers failed – there’s an underlying electrical problem somewhere that wasn’t there before and I haven’t found it yet. It passed the MOT and on 18 January we dropped the car at the container terminal and hopefully we’ll see it again in Buenos Aires in February. 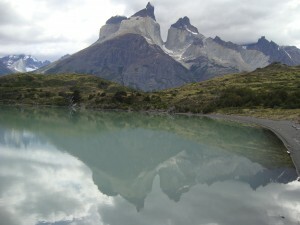 You are currently browsing the archives for the Patagonia 2010 category.